The value of the books increases dramatically with the addition of the BTS Reading Planner ®. If you want to read a large section of the Bible or the whole Bible, you need a reading schedule. You need a way to divide the reading in a balanced fashion. Having a printed reading plan is especially helpful if you are leading a group. One person may want to read through the gospels over two months starting on May 20th. A group may want to read through the Bible in a year starting on January 1st. The BTS Reading Planner ® accommodates all needs! 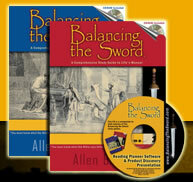 The Balancing the Sword Reading Planner may very well be the most flexible and accurate reading scheduler available. The planner is not based on reading three chapters per day nor on reading so many verses per day. Rather, the Reading Planner divides the Bible so that you are reading the same number of words per day. The planner performs a literal word count for everyday and rounds up or down according to your preference. The retail price for the reading planner is $9.99. Yet, the service is FREE with the books. You will enjoy this ability to create a customized reading plan for years to come. You will love this software! "The Balancing the Sword set also comes with the best Bible reading planning software I've ever seen. No kidding. This software tool allows you to plan a customized Bible reading plan that will actually fit your life. First, if you like, you can test your reading speed so it can tell how much to assign you per day (according to the time limit you specify later on in the process). You can also specify days to skip (like weekends or holidays) and divide your readings into one, two, or three sessions. You can also decide which books of the Bible you want to read or which sections. It is amazingly versatile. Honestly, it's worth buying the set just to get this software. " Detailed Review - Learn of the software's unbelievable flexibility and tremendous ease. Detailed Review on CD - Older versions of the Balancing the Sword books came with a CD-ROM. There is a detailed review of the BTS Reading Planner ® on the CD that comes with the books. The new software is on-line. NEW On-Line Software. Learn more. Updates - Check for the latest updates.